Ready for a Hyatt Resorts Vacation? A stay at an all-inclusive Hyatt Resort combines the best of luxurious comforts, exciting entertainment and cultural immersion with inclusive amenities and optional excursions. Hyatt resorts are located in some of the Caribbean's most breathtaking destinations like Cancún and Puerto Vallarta, Mexico and Montego Bay, Jamaica. Guests will find vacation living easy when they experience unlimited gourmet dining, endless drinks, live entertainment and classes, and infinity pools, all while staying minutes away from the beach. Whether you are planning a family vacation or couples retreat, Hyatt Resorts offers both family-friendly and adult-only resorts. Each Hyatt resort offers a variety of rooms and suites that include amenities and features like private balconies and furnished patios, 24-hour room service, a mini-bar, plush robes and jetted hot tubs. Your dining options are unlimited and you can try food from your destination, enjoy an elegant dinner or get a bite to eat at the 24-hour snack bar, all included in your stay. You can enjoy endless drinks, including premium top shelf wines and liquors, at multiple hotspots and themed bars like the pool bar and tequila bar. Guests can always find something fun to participate in like parties and games in the pool area, classes, and live entertainment including performances from local musicians and dancers. Wedding, honeymoon and anniversary packages are available for an additional cost, however some wedding packages are complimentary for more intimate celebrations. Kids can make new friends and participate in supervised games at the KidZ club at the family-friendly Hyatt resorts or hangout at the mini waterpark, when available. For guests looking to take it easy, each Hyatt resort offers multiple swimming pools and whirlpools, but if you're looking for more adventure, you can try non-motorized watersports like paddle boarding, kayaking and scuba diving. If you want to stay active during your vacation, Hyatt Resorts provides a Fitness Center equipped with cardio and strength training machines. You can also take advantage of onsite trainers and fitness classes. You can stay connected with complimentary Wi-Fi available resort wide. Interested In Hyatt Resorts Resorts? 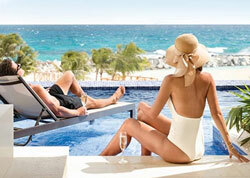 Interested In A Hyatt Resorts Vacation?